Deacon Dr. Fresh Wine Newsletter: The Deacon and Deaconess Dine with the Dean and Deborah! The Deacon Meets the Hypnotist! The Deacon Meets a Dead Rocker! The Deacon and Deaconess Dine with the Dean and Deborah! Yo Homeys, Hoze and Winebibbers! And a real special "Hi, and Bite me!" to all you crackerdine moisture-missile donut-gobblin' cedar brains who still just don't get it, but tune in regularly anyway just to find out what His Excellency has been doin' and what starz he's been sayin' wassup to! Now perhaps you're wonderin' exactly what category you fit into...Y'all might be thinkin' "Am I a homey or a crackerwood peckerdine? I'm not sure..." Well honey, if y'all gots to axe a question like that, rest assured you'ze a mofo bagscratch saltine crackerwater and there aint no hope for you! A few weeks back your humble Deacon attended an invitation only dinner at the Aspler Mansion. The Deaconess was as up about it as I was, 'cause a free barbecue will always get the Deacon's attention; besides, she was eager to meet Pinot the Wonder Dog, the Aspler's expeshully lurch Wheaton Terrier. It was a balmy evening, so I decided to take the Aston Martin. I didn't want to arrive too early, as I knew the Dean was gonna be flyin' in from BC where he'd been givin' some lurch and timely advice to the homeys on the coast. Fortunately, we arrived pretty much simultaneously, which for the illiterate crackers means "at the same moment in time". We had a real lurch dinner! Tony's lovely and elegant wife Deborah whipped up a ton of food in short order. We sat out on the deck and consumed delicious, rich tapenade with fresh breads and Sumac Ridge Pinnacles Brut 2000, a very clean, sharp and refreshing bubbly. Tony fired up the barbecue and I sat in the shade, alternately watching Tony expertly battling the 3 foot flames and Pinot the Wonder Dog wandering in and out of a neighbour's house. We hastened indoors for the main course, and I could go on and on about the delicious dinner served in impeccably decorated surroundings, the Mountain Road Barrel-Fermented Chardonnay 2002 and Arrowood Grand Archer Cabernet Sauvignon 2000 from Sonoma, but what's the point? Y'all gets the idea. It was an amazing evening, the Deacon and Deaconess were invited, and you weren't. Tony's just completing his most ambitious book yet; and it's one you crackers and homeys alike, have gots to grab a copy of. As you can see from the picture on this posting, its a wine atlas. And note that it's not an atlas of Napa or Tuscany or Bordeaux. 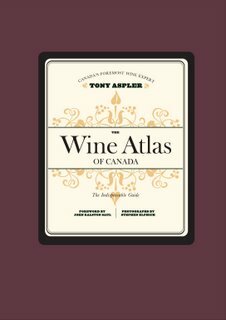 It's a Wine Atlas of Canada! I'm tellin' y'all, I got a good look at the proofs for this baby and it's the real deal. As my loyal readers know, the wine industry is exploding in Canada and it's almost impossible to keep up on who's growin' what and whether it's lurch or jank! Well, the Dean has risen to the challenge and has gathered a plethora of fantastic information to make the formidable Canadian Wine Scene comprehensible to even the most jaded jankbucket. This veritable tome is richly illustrated and a delight to browse. It will make a great addition to any budding winemaster's cappuccino table. 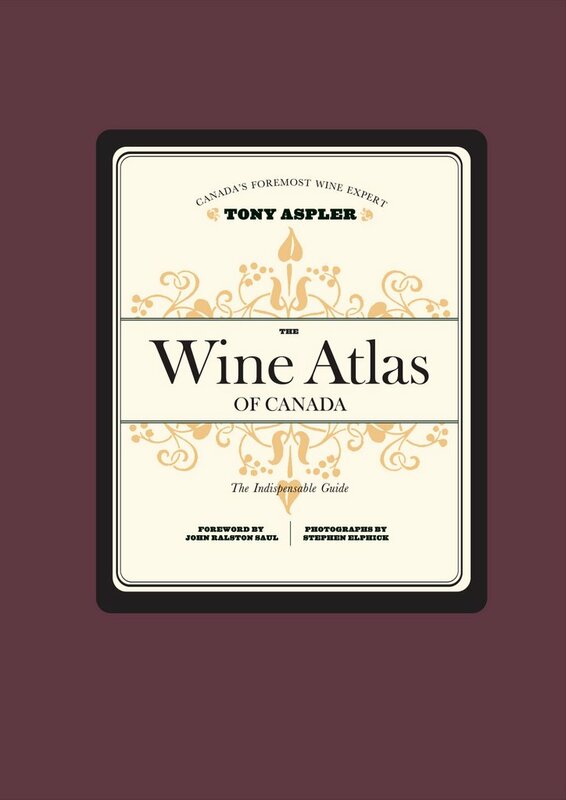 Look for The Wine Atlas of Canada (published by Random House) in stores on October 28th. That's just in time to make a great Hallowe'en gift, or stock up in time for Christmas! Y'all check it out. I know I will. Thanks Tony and Deborah. Your humble Deacon will reciprocate. Either dinner or lunch or a book on armlocks and neckcranks. This just in...Your Deacon has received notification from "a usually reliable source" that the LCBO are gonna outsource their infoline to Bombay! From now on, when you call (416) 365-5900 you'll be rappin' with a dude or dudette in India. I ain't sayin' this is good or bad. I'm just sayin' it's so. The operators are being chosen for their ability to sound Canadian, with an affected Ottawa Valley or Owen Sound accent being the preference. Another tidbit for you: What's hip-shakin' Latina babe Shakira up to these days? Your Deacon has it on very good authority that she can be found waitressing at Amaretto Restaurant in Stouffville. Don't take my word for it. Check her out for yourself. She works Friday night for sure. I think you meant to say "you're" which is a contraction of "you are" but since you're an illiterate American (which is redundant) you can't be expected to know that.